Recent figures and projections for California uninsured rates. A new study by UCLA and UC Berkeley researchers projects that hundreds of thousands more Californians could become uninsured because of forthcoming changes in federal health insurance law. Beginning in January 2019, new policy will remove the Affordable Care Act’s individual mandate penalty, the fee assessed to people who do not have health insurance. 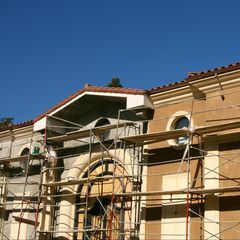 The report uses the California Simulation of Insurance Markets model, which was developed by the UCLA Center for Health Policy Research and the UC Berkeley Labor Center, to forecast how many Californians will be uninsured in 2020 and 2023. Thanks to California’s effective implementation of the ACA, the percentage of uninsured non-elderly Californians fell to 10.4 percent in 2016 (representing 3.55 million Californians under the age of 65), from 17.6 percent in 2012. 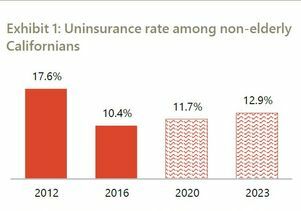 The report projects that without California taking action to protect and build upon these gains in coverage, the uninsurance rate could grow to 11.7 percent in 2020, or approximately 4.0 million people under age 65, and to 12.9 percent in 2023, or 4.4 million people. These estimates include undocumented Californians who only have restricted-scope Medi-Cal. The report forecasts that the most substantial enrollment changes will occur in the individual market. It also details which populations are projected to remain uninsured — such as undocumented Californians — and which will struggle to afford insurance.